Below is a continuous series of sagittal histological sections and color-coded maps of the nuclei in them within coordinate system. 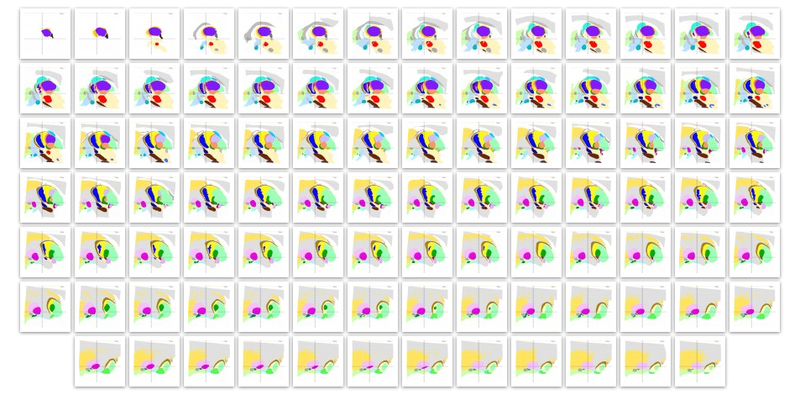 The selected 3D images of the motor thalamus placed in MNI space can be viewed in Ilinsky et al. 2018. 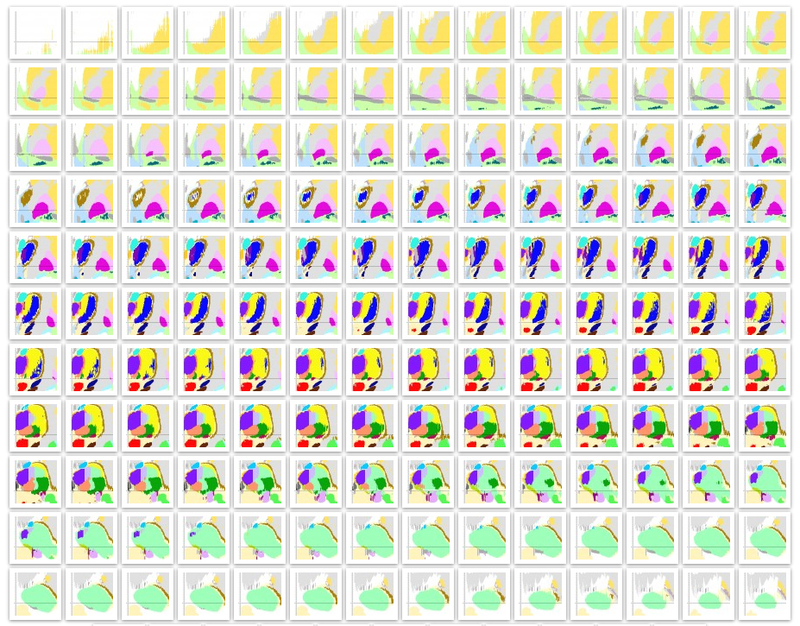 Complete MNI version can be viewed and downloaded from Lead-DBS website. Look for Human Motor Thalamus Atlas – resolving controversies………. Please register in order to get access to the original images. 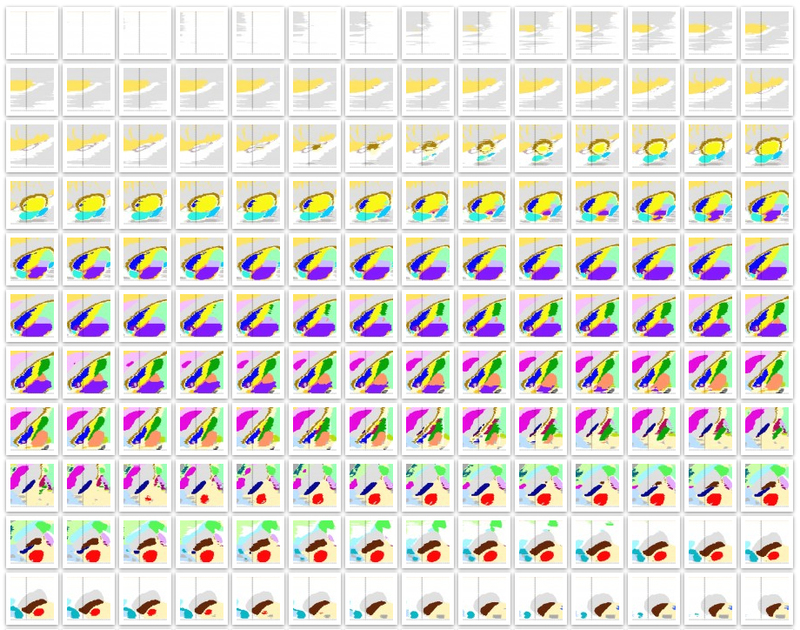 Open your wanted images page, right click to open the following link “Open Abbreviations/Color code” (sample) in a new window and adjust its size to your liking. To work with several images at the same time right click on the thumbnails and open them in another tab or separate window. Distances of sections from zero coordinate planes are shown in mm in the upper right corner of each image. Distances of sections posterior to the zero coronal plane and horizontal sections below the zero horizontal plane are marked with negative numbers. Tics on coordinate axes are at 0.5mm intervals. 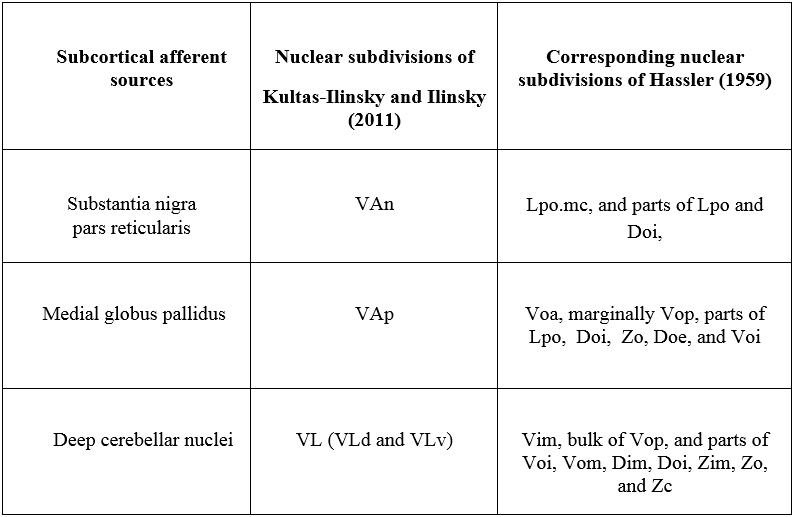 For motor-related nuclei we used earlier proposed nomenclature (Kultas-Ilinsky et al., 2011). Obviously, it is simplified to the limit as compared to Hassler’s (in Schaltenbrad and Bailey, 1959). VL as outlined here corresponds to the so-called cell-sparse zone, which in nonhuman primates coincides with the territory of cerebellar afferents (E.G. Jones, The Thalamus, 2007). Hassler’s Vim and Vop, the two most widely used targets in stereotactic neurosurgery, are situated in the most ventral part of VL, which we call VLv. However, the total territory of Vim and Vop is smaller than that of VLv (Ilinsky et al. 2018). VLv differs from the dorsal VL region (VLd) by cytoarchitecture and intense immuno-staining for microfilament protein marker SMI31 (Kultas-Ilinsky et al., 2011). The two VL subregions also display differences in the ultrastructure, specifically in synaptic relationships of cerebellar afferent terminals, as shown in monkeys (Mason et al., 1996). VA, as a whole represents the basal ganglia afferent territory. The two subdivisions distinguished in it (VAp and VAn) correspond to pallidal and nigral afferent territories, respectively. They also differ by cytoarchitecture. VAn incorporates the distinct magnocellular nucleus (Hassler’s Lpo.mc and Olszewski’s VAmc), but the nigral projection zone extends also dorsally and laterally to the magnocellular part, thus VAn is larger than Lpo.mc. Correspondence between nomenclature used here and that of Hassler is summarized in the Table below. Detailed discussion of the differences and similarities between the ventral and dorsal subdivisions in the motor thalamus can be found in the manuscripts cited above. Apart from the motor nuclei, several large nuclear masses have not been parcelated in the current maps. For example, our material did not allow identification of boundaries of all pulvinar subdivisions with a reasonable degree of confidence, only lateral subnucleus was distinct. Also in somatosensory afferent territory the border between VPm and VPl was not shown, but VPi was quite distinct, hence it was labeled differently from the rest of VP. Likewise within MD the boundaries between its subdivisions were left unmarked. Moreover, since CL and densicellular MD subdivision are intimately intertwined, the boundary between them was not drawn. Hence the lateralmost region of MD was marked with a lighter hue of the same color and labeled as MD/CL. In short, the accurate identification of these boundaries is left to experts in each field. When available they can easily be incorporated in this dataset. The line between anterior (AC) and posterior (PC) commissures establishes zero horizontal plane, which is perpendicular to the midsagittal plane. A plane perpendicular to the zero horizontal plane passing through the midpoint of AC-PC line establishes the zero coronal plane. Distances of sections posterior to the zero coronal plane and horizontal sections below the zero horizontal plane are marked with negative numbers. Mediolateral distances are measured from the midsagittal plane, i.e., midline. The 0.00mm section in the sagittal maps passes through the massa intermedia. Tics on coordinate axes are at 0.5mm intervals. 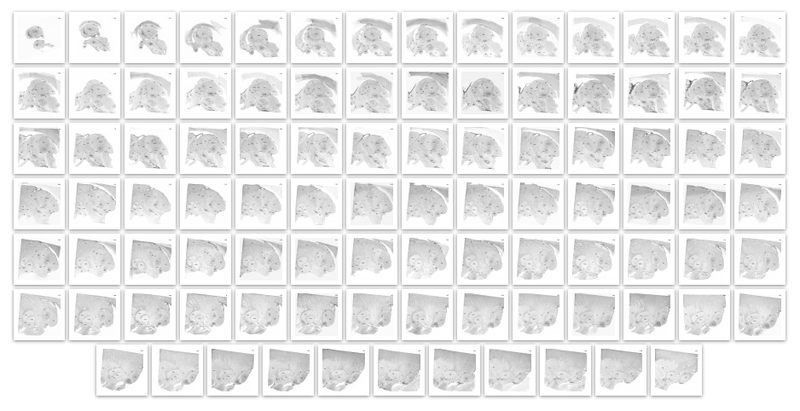 The images are derived from the volume of original coronal scans of the formalin fixed tissue block. 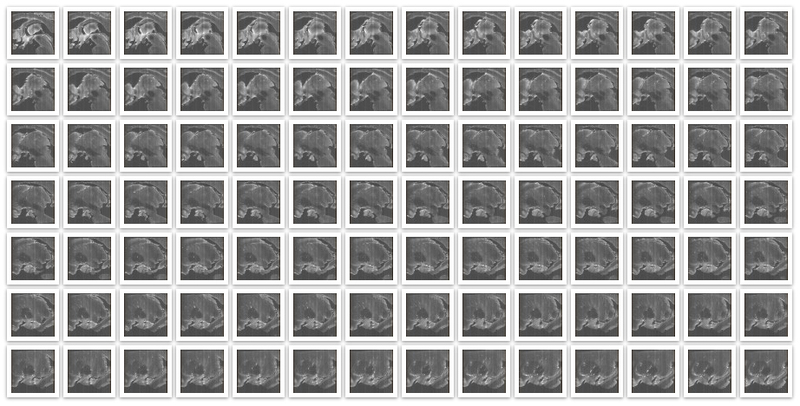 Shown are continuous sagittal slices at 0.25 mm intervals just as the sagittal histological images. Due to difficulties with positioning the tissue block in scanner so that its medial surface is oriented strictly parallel to the midsagittal plane the cutting angles of the two sets are not exactly the same.